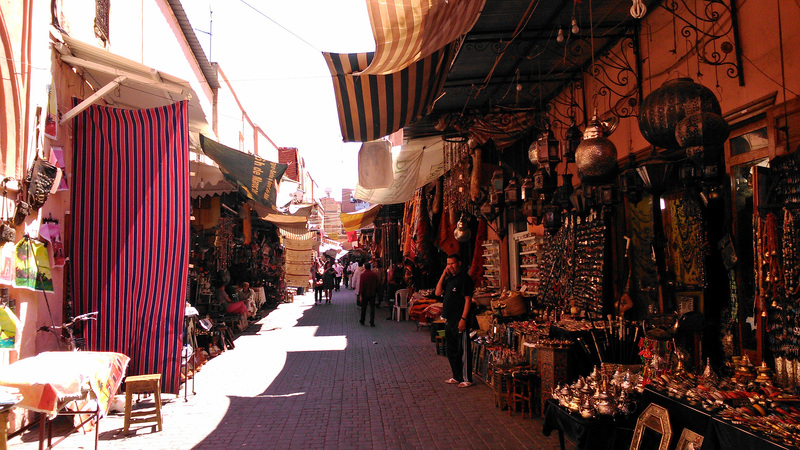 On our 4th day, we went back to the medina of Marrakesh. 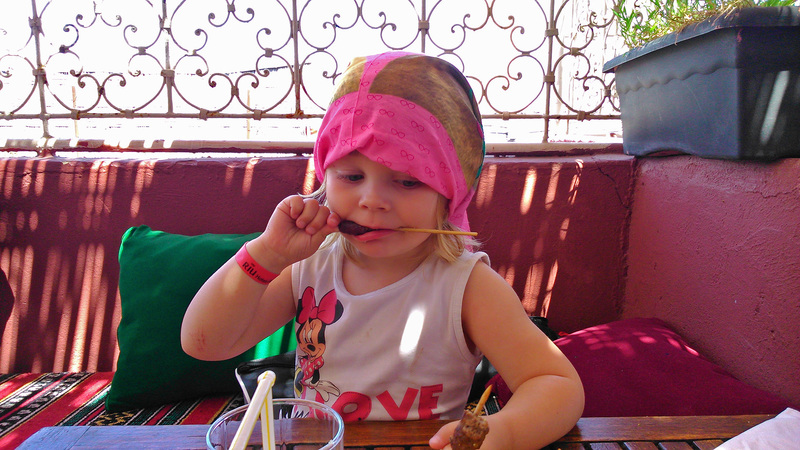 You must understand that we are traveling with a 3-year-old. 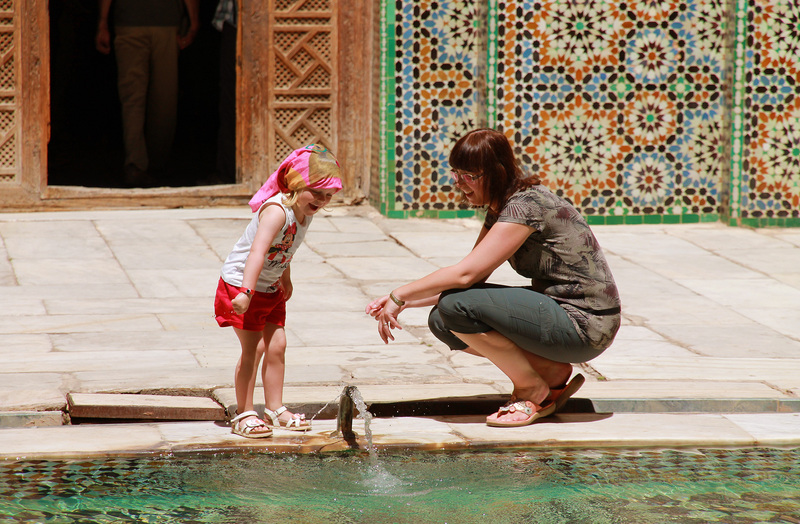 She’s just the perfect travel companion, but traveling with 3 also means finding a compromise between each of our wish lists. Playing in the swimming pool of the hotel is obviously high on Febe’s wish list, so we always make sure to make time (in the morning or late afternoon) to jump in the pool with her each day. Today, we enjoyed some pool time in the morning. Febe wanted to check out the indoor pool, which was completely empty at that time, and much warmer than the big outdoor pool. 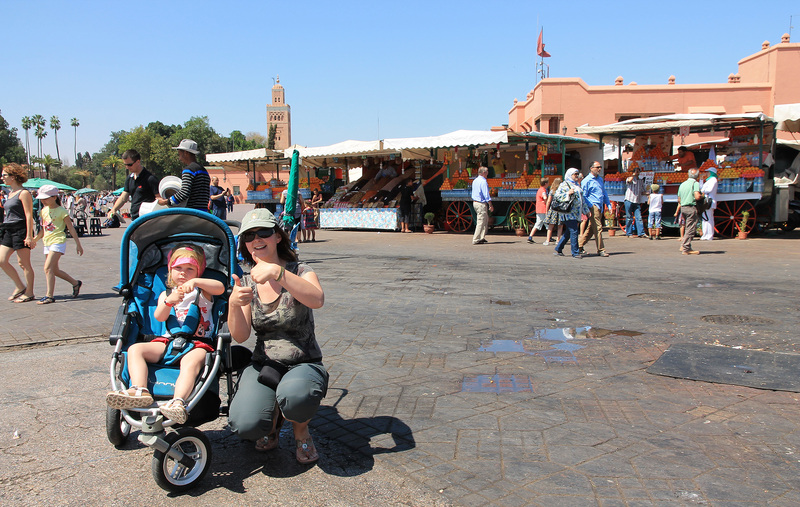 Just before noon, we took the shuttle bus from the hotel (this was soooooo easy, just perfect) to Marrakesh city. 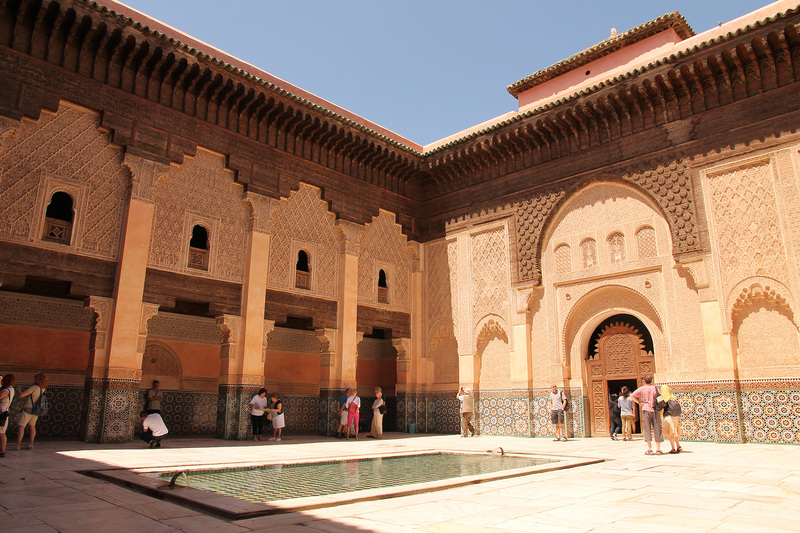 We drove through the Palmeraie or palm grove (which used to be a much larger palm forest, planted by the Almoravid rulers in the 12th century), where our hotel was located, to the medina walls and inside the medina up to the Place de Foucauld. Our goal was to more or less see all the highlights we hadn’t seen two days ago, starting with the world famous Djemaa el Fna square. 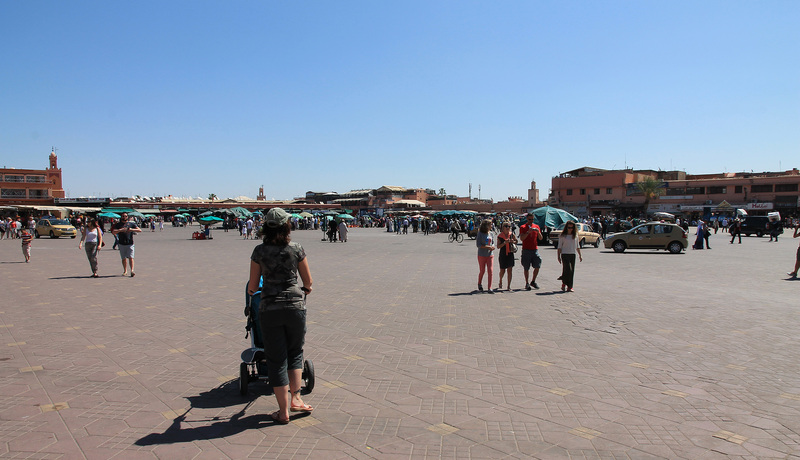 When we arrived, the square wasn’t too crowded, and so we were quite relaxed. We all don’t fancy large, noisy crowds when we travel. We prefer the peace and quiet. However, being relaxed in this place also meant we forgot all about the good advices and precautions. And so we stumbled into a tourist trap. 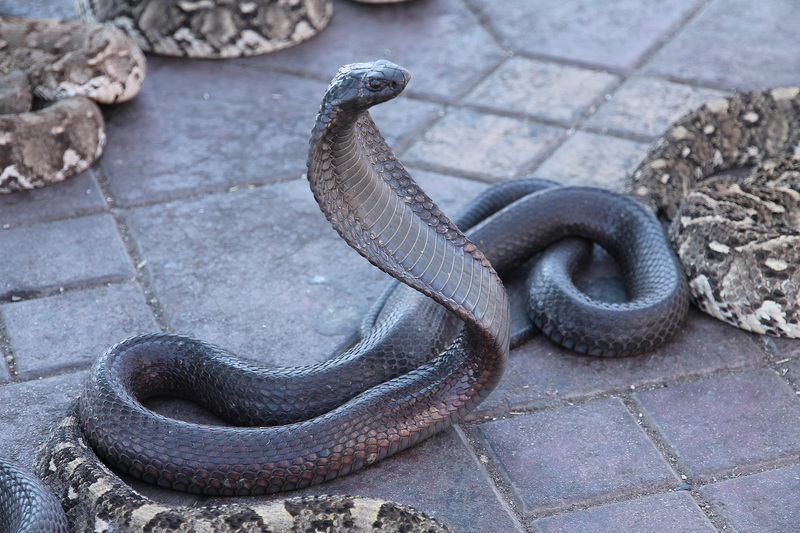 Before we realised it, we had half-dead snakes hanging from our necks… Knowing we were already doomed, I took the opportunity to photograph the lively ones from very (too?) close-by. 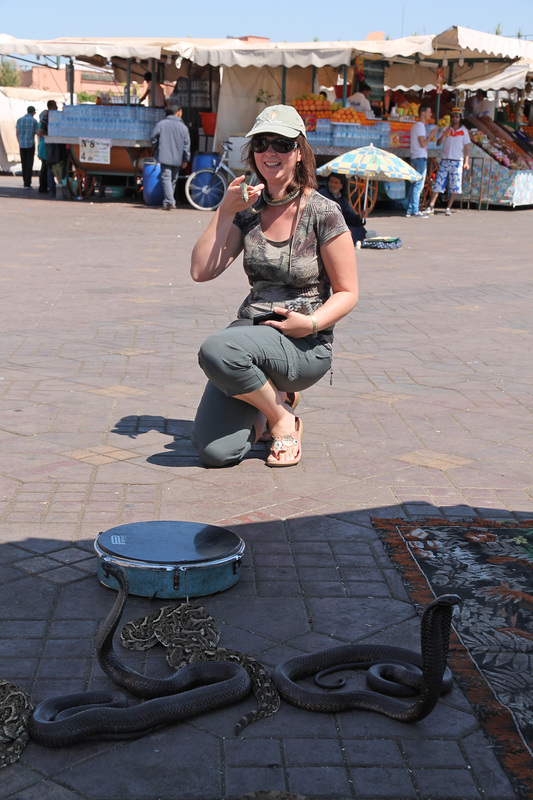 Afterwards, we were presented the ridiculous price (around 500 dirham: that’s around 50 euro!) they asked for this “favour”. We refused, argueing the experience didn’t match the price, and went away after paying only a third of that price (150 dirham: still a straightfoward rip-off), leaving the guy furious. We have no issues with people trying to make a living, but this was simply ridiculous! 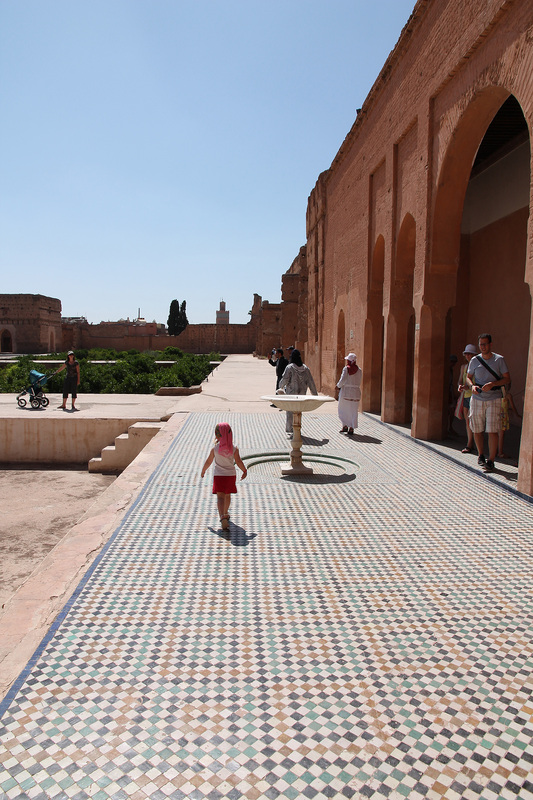 We then headed for the Ben Youssef Madrasa, a walk that would take us right through the souk El Jadid. 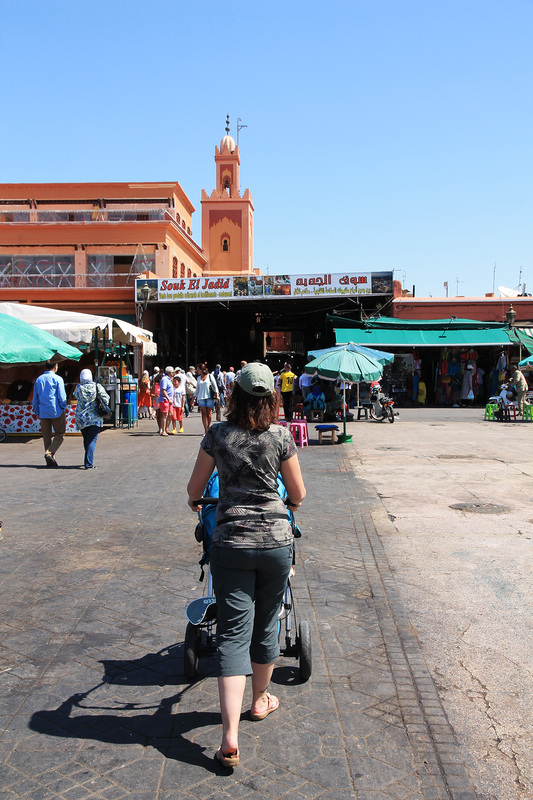 Although the part closest to the Djemaa El Fna square was very crowded with tourists and you could only find all kinds of rubbish there (jewelry, T-shirts…), going deeper into the souk is really the way to go. Becoming lost here is not a disaster at all (we did): just go on instinct and position of the sun to get a general direction of where to go, and absorb the atmosphere. 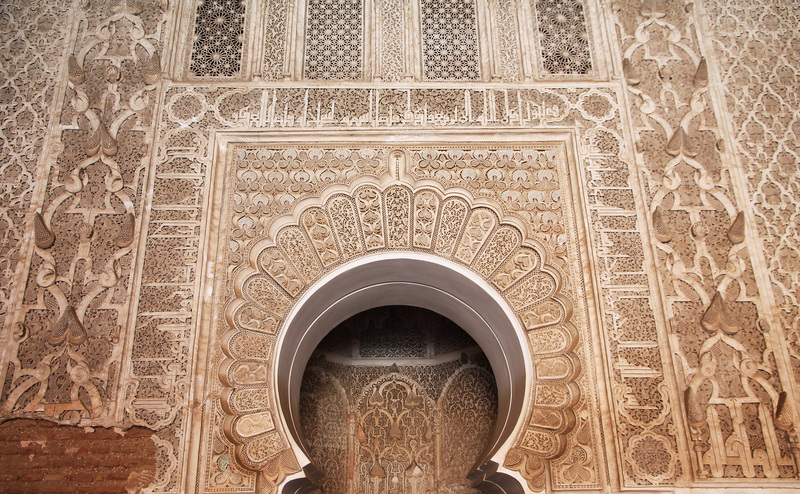 Also look out for delicately decorated doors (more on this post). 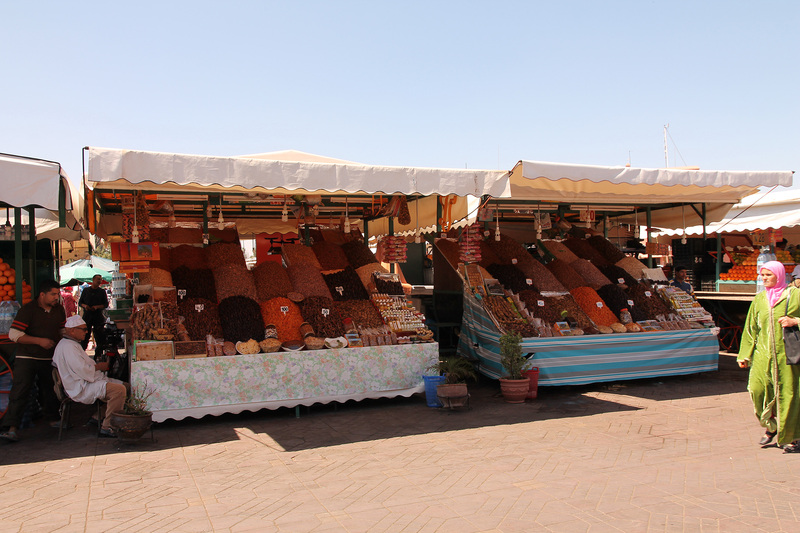 The souk is clearly divided into areas by type of craft. 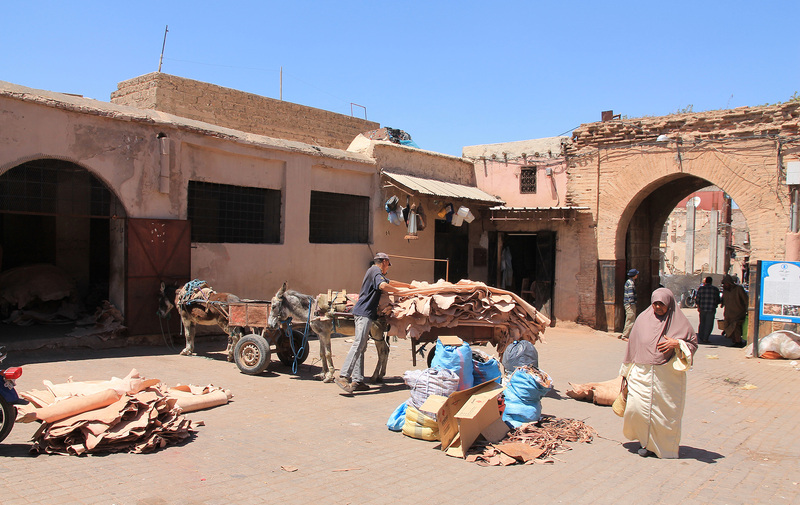 For example, deep inside the souk you will find the Tanners’ district. 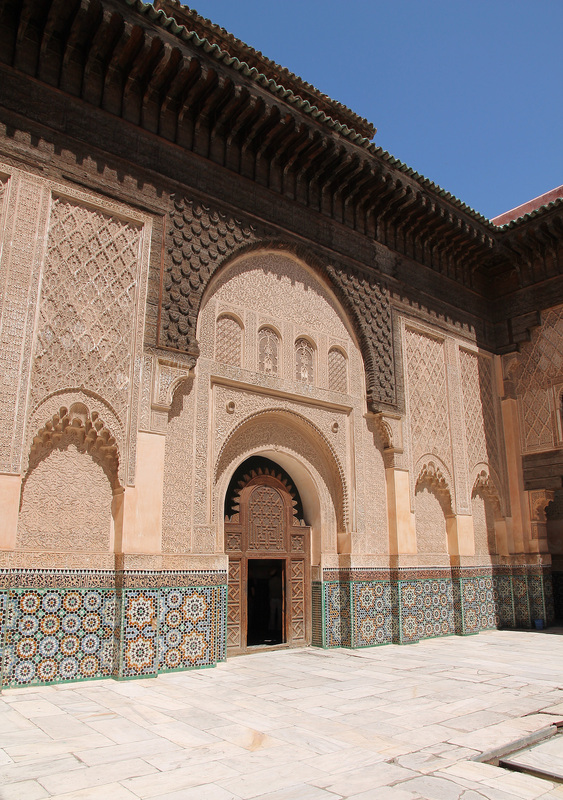 Close to the Tanners’ district is the former Islamic college known as the Ali Ben Youssef Madrasa (or Médersa), founded in the 14th century. It’s composed of a central courtyard surrounded by 132 student dormitory cells. 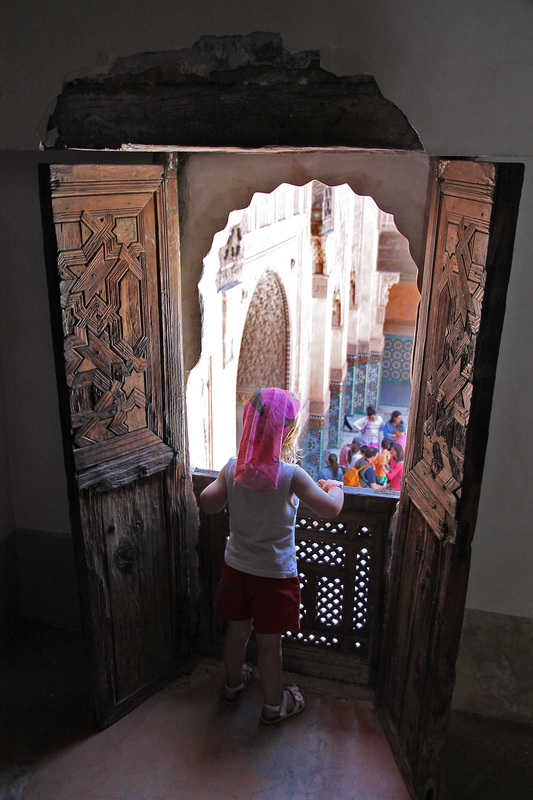 The courtyard is richly decorated with mosaic walls (zellij), stucco archways, carved cedar windows and Carrara marble. 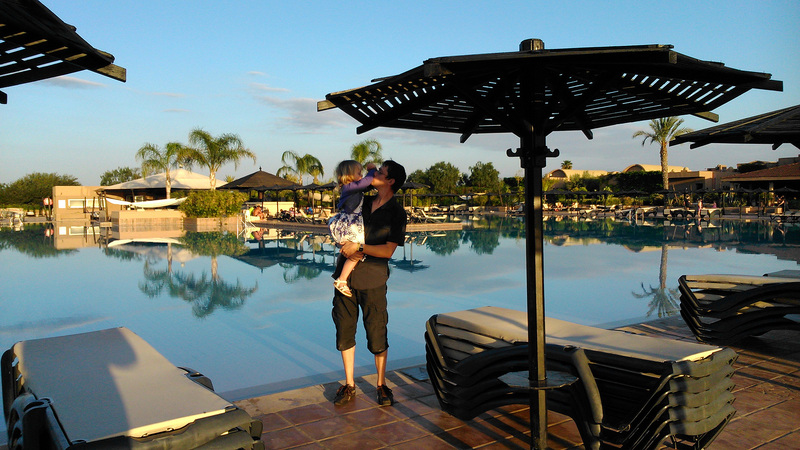 Ánd there is pool fun opportunity (more or less)! Colours and shapes – mindblowing! In contrast, the student quarters are much more modest. 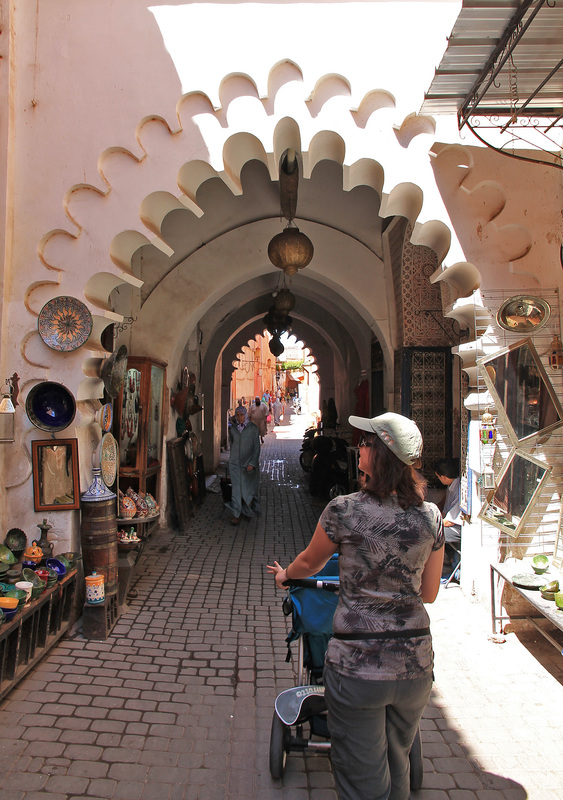 We went back to the souk, in search of Souk Kafé. 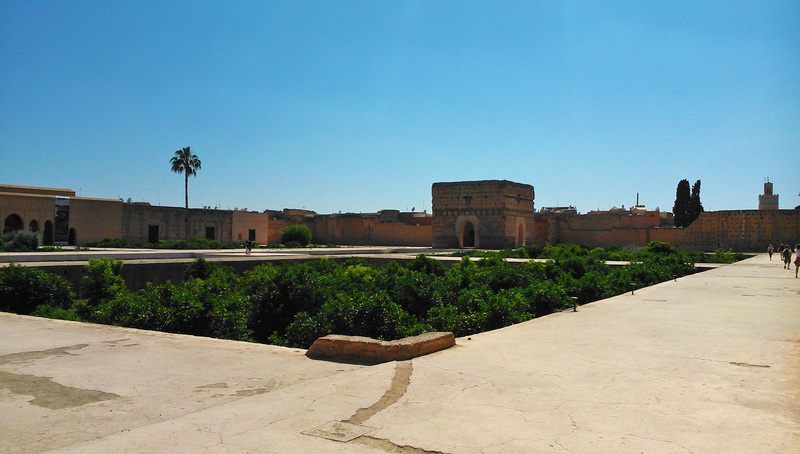 We passed by the Koubba Ba’adiyn, a 12th century shrine (built by the Almoravid rulers). We were there around noon, but couldn’t find a gate of entry. The Koubba seemed closed to the public. I almost overlooked the entrance to Souk Kafé, which is quite discrete. 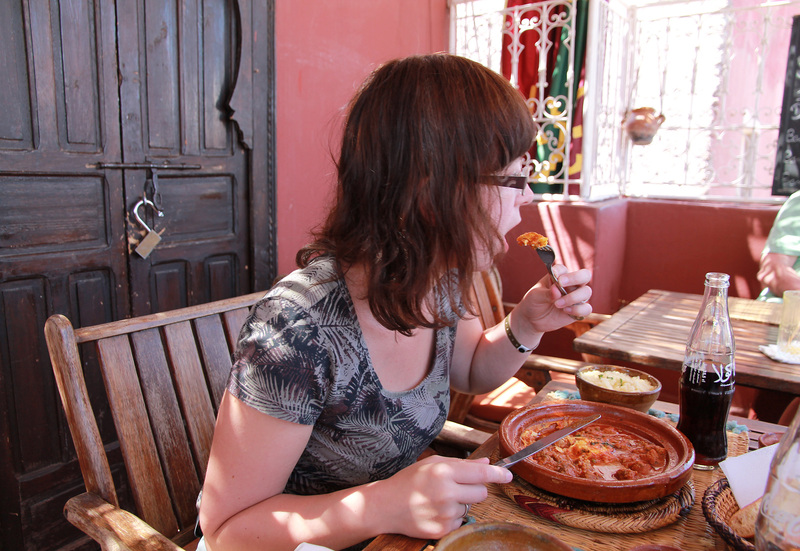 They still had a table on the small roof terrace, which is just soooo relaxing after hours in the busy souks. 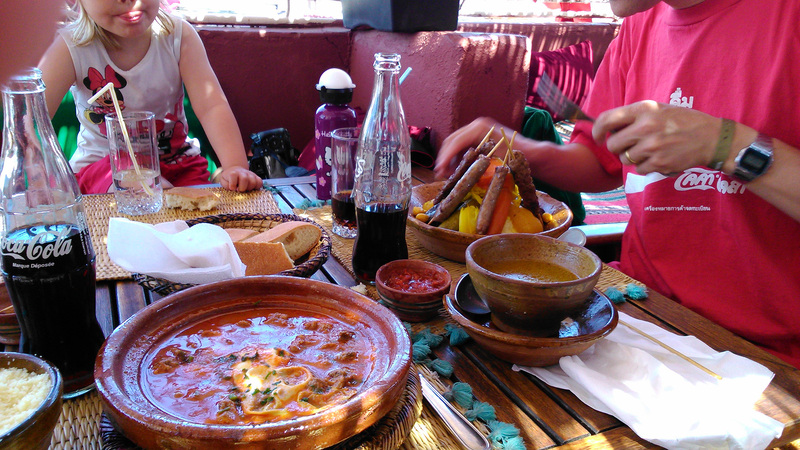 The food was great as well: both the tajine and the couscous with sausages were spicy and delicious. We stayed here for a while in the shade of the umbrella. 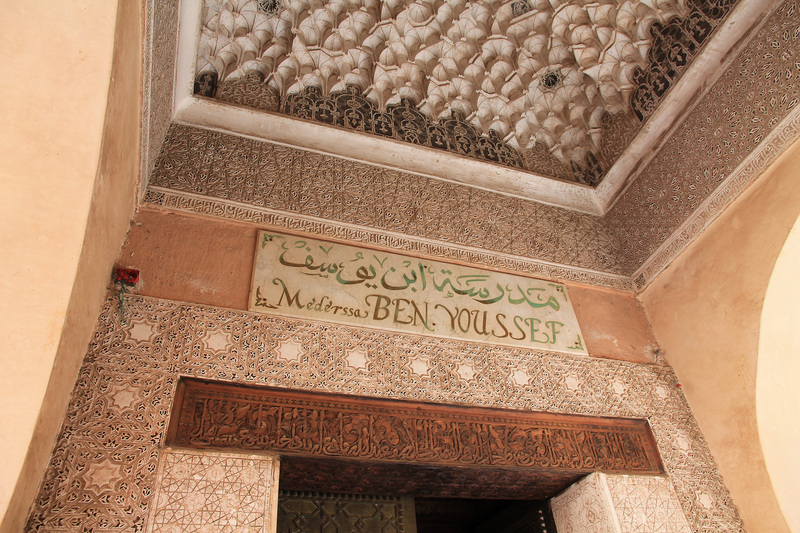 Our final stop was the El Badi Palace, which we reached through the Rue Riad Zitoun el-Kedim. 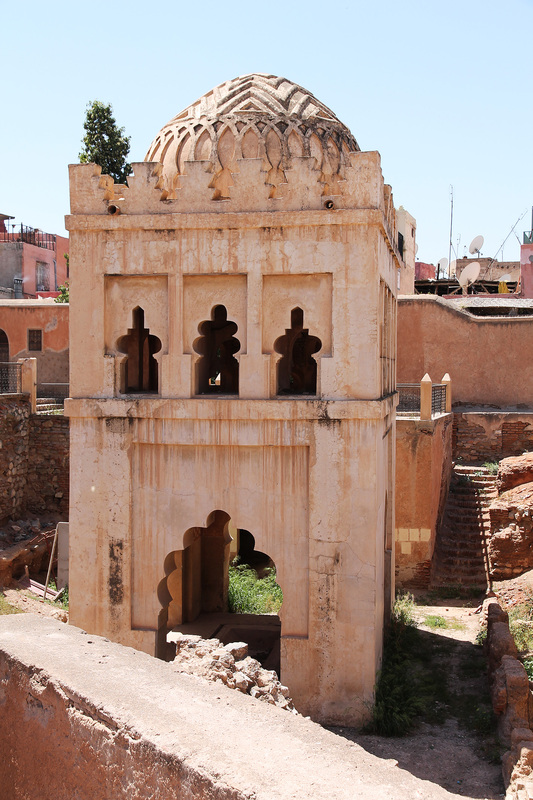 Now a ruin, its sheer size reflects the grandeur of this palace of the 16th-century sultan Ahmed El-Mansour. Really impressive! The perfect place to relax in tranquility if you’re tired of the noise and bustle of the city. 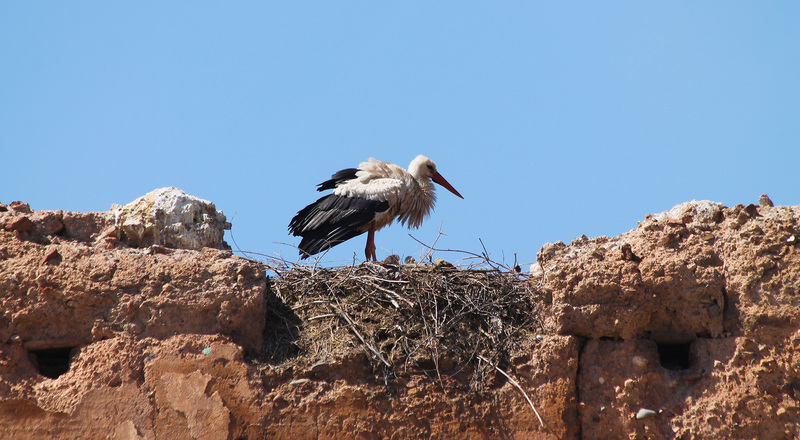 We especially liked the storks nesting on the ancient walls of the palace. 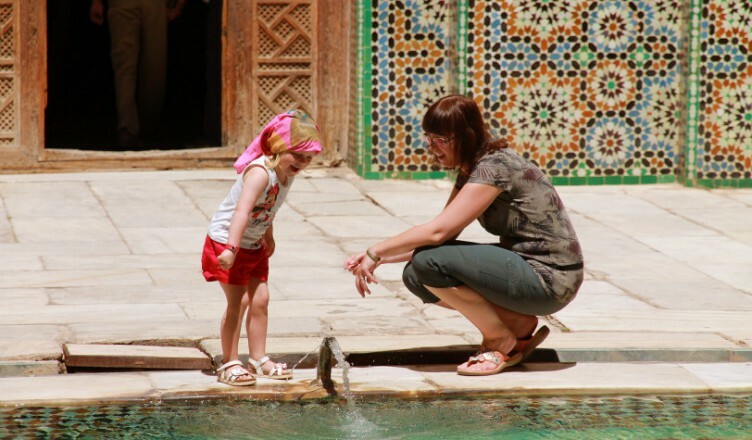 Marrakesh has a long history as an important political, economical and cultural centre in the Western Muslim world. 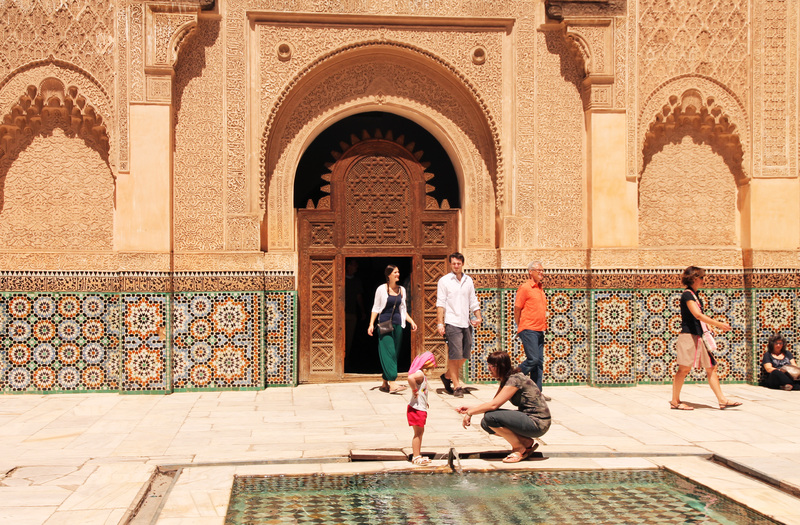 This vibrant, historic city is a typical example of a large medieval, Islamic capital; it combines the business of daily life, crafts and trade (e.g. 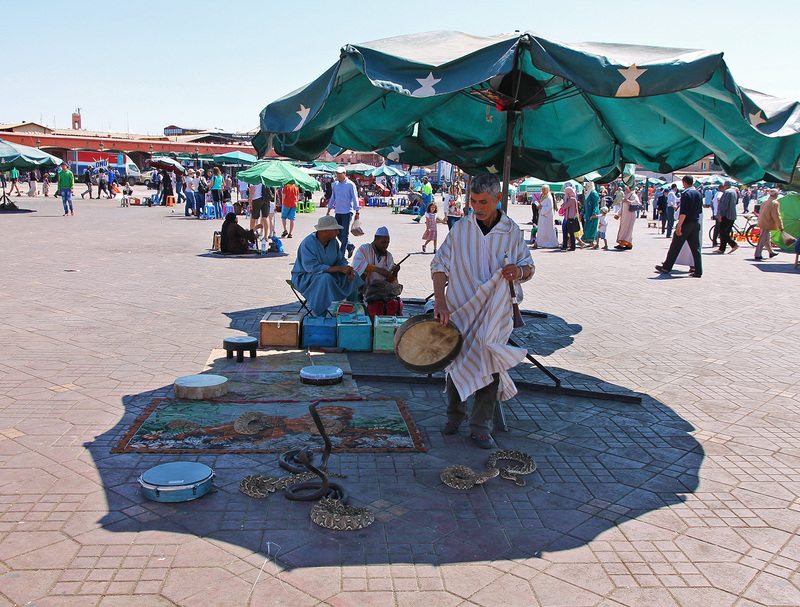 the souks and Djemaa el Fna square) with the calmness of its religious centres (e.g. 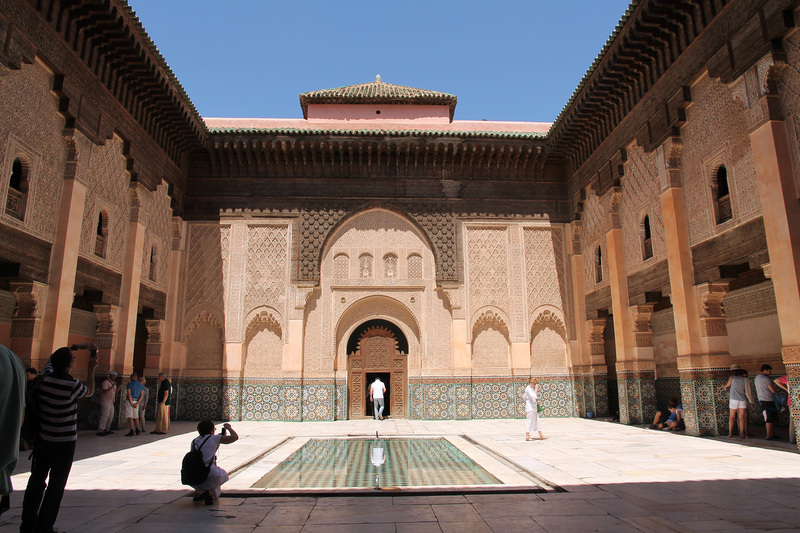 mosques and the Ben Youssef Madrasa) and the grandeur of its palaces (e.g. 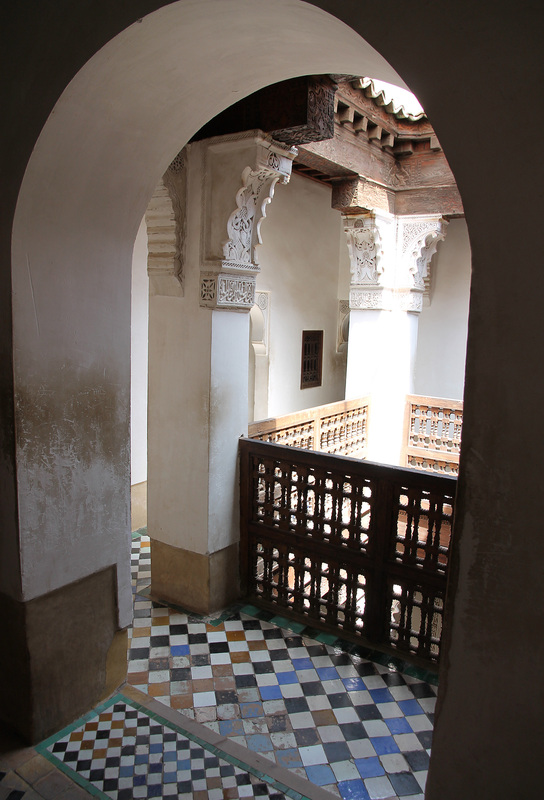 El Badi palace, La Bahia). 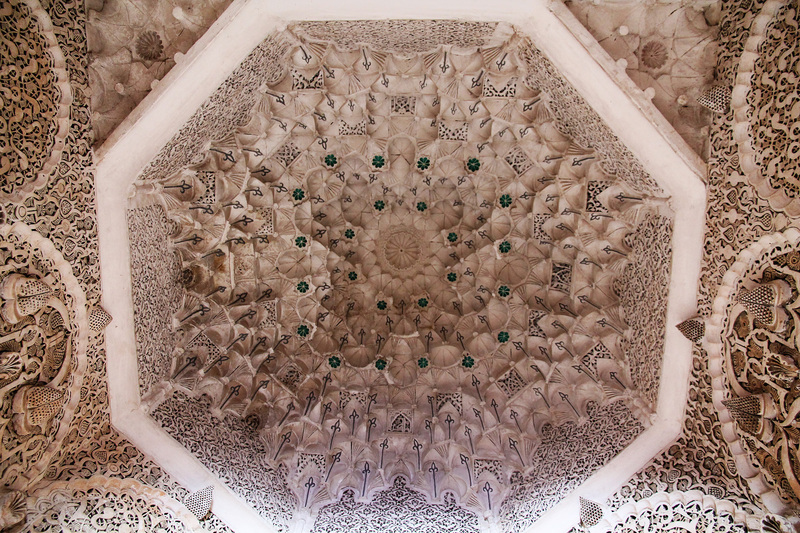 The city was founded in the 11th century by the Almoravid rulers. 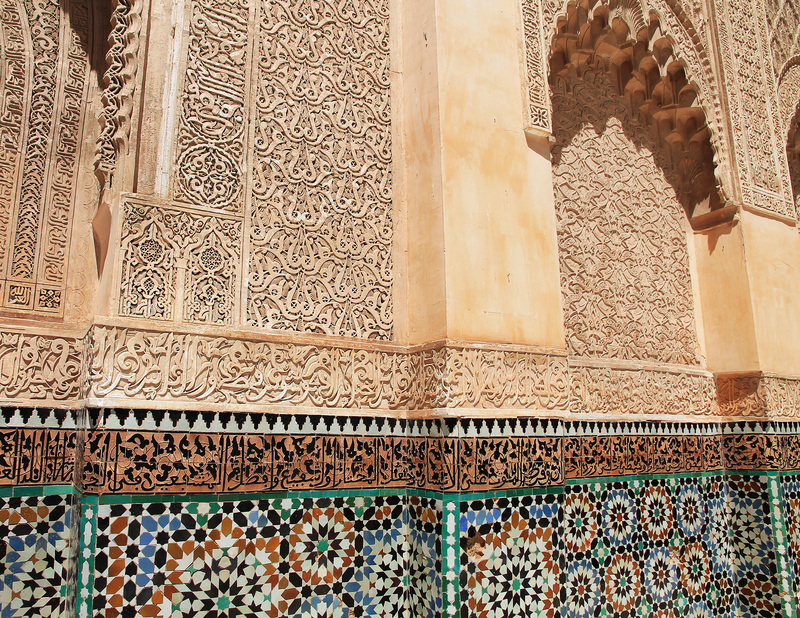 The general outline of the medina dates back to this period. 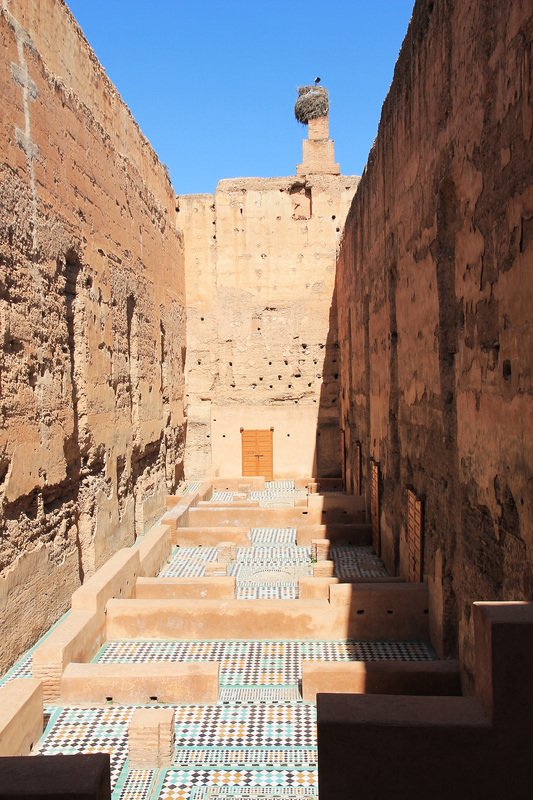 Under their reign, the medina was walled and a huge palm forest (Palmeraie) was planted. 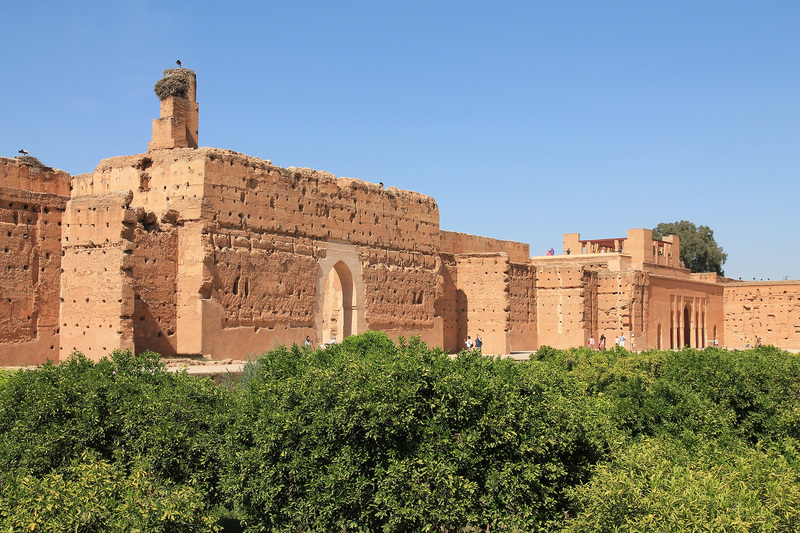 It remained the capital under the Almohads, who destroyed most of the Almoravid monuments but also led Marakesh into a period of unprecedented prosperity. 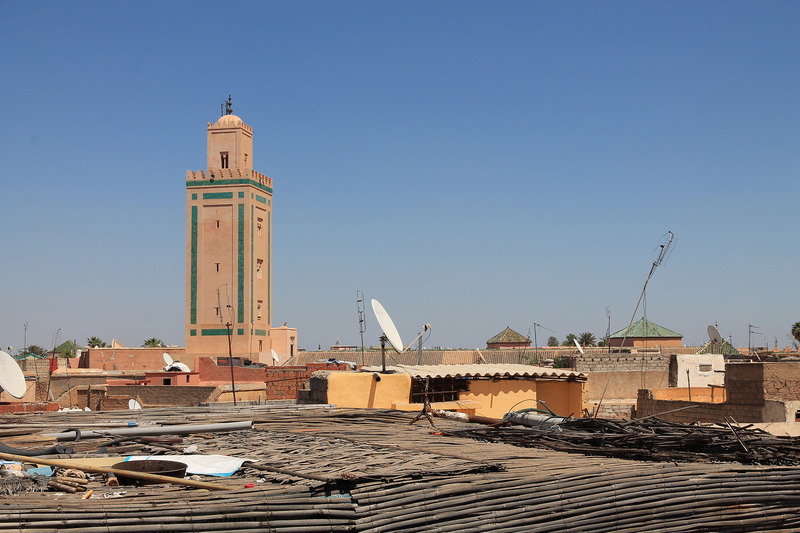 They were responsible for building the grand Koutoubia Mosque (with a 77m minaret!). 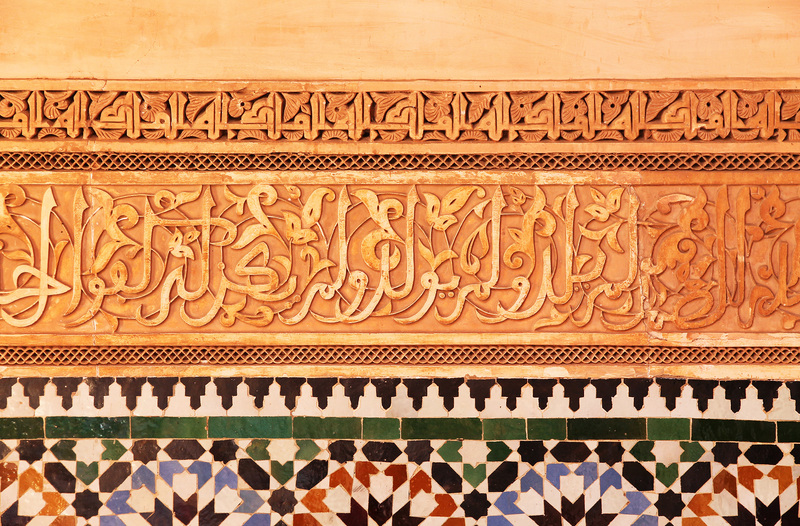 After a period of decline, the Saadian rulers (16th-17th century) led to a new blossoming of the arts. 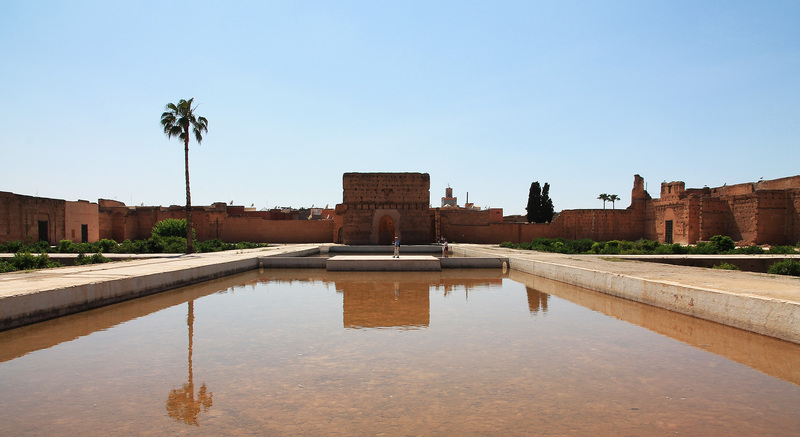 The El Badi palace and the Saadian tombs were built under their reign.